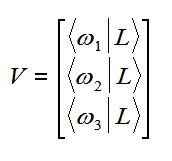 Vectorial Sensitivity to narrow-band lights. Early Color-Matching Data of Guild or Wright. Wright and Guild both used red, green, and blue primaries. The wavelengths are not really arbitrary. The mixing of 3 primaries models technologies such as television. 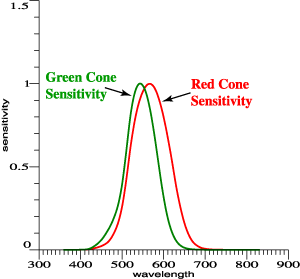 Practical question: what wavelengths work best as primaries? So, we think in terms of the chromaticity diagram... but those primary colors are still needed. Which Wavelengths Act Most Strongly in Mixtures? MacAdam, and later Thornton did calculations like this. Narrow-band lights of constant power are mixed with equal energy light. 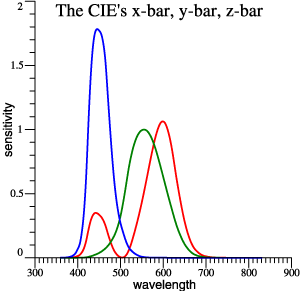 Some wavelengths perturb the white chromaticity more than others. 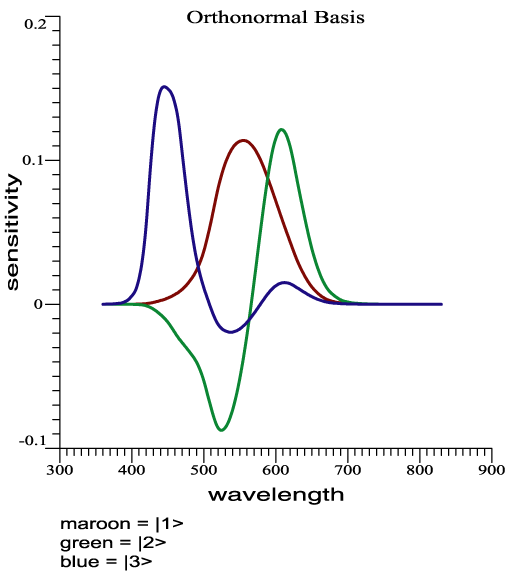 Thornton coined the term "Prime Colors" for the 3 wavelengths that act most strongly. When the Primary Wavelengths Are Changed. 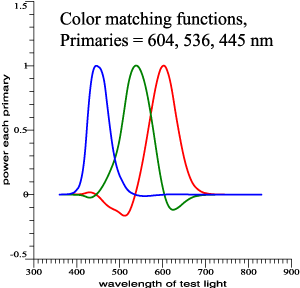 The color matching functions tend to peak at certain fixed wavelengths, despite perturbation of the primaries. The peaks occur at the prime colors. Prime color primaries run the experiment at minimum power. When one primary wavelength is changed (say the red wavelength only) then the associated (red) color matching function changes only in scale, not in shape. 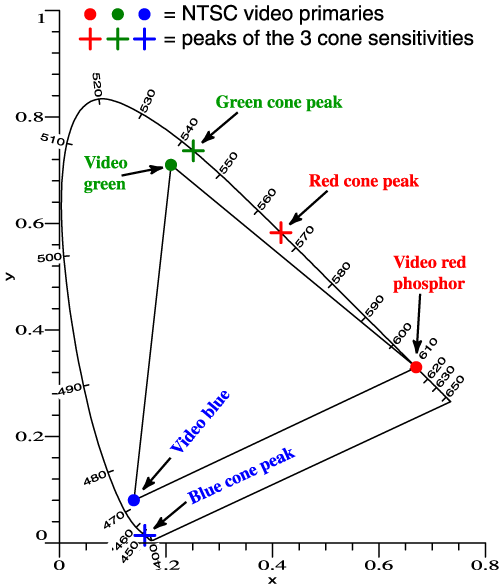 Red and green cone functions are highly overlapping. 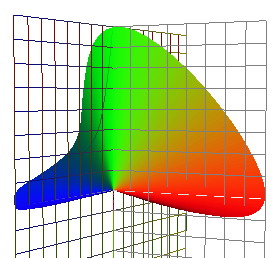 Subtracting green from red gives peaks to account for Prime Colors, but the scaling is arbitrary. 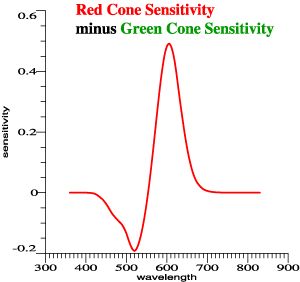 Achromatic sensitivity, y-bar, is a linear combination of red and green. Find a second combination that is orthogonal to it. But Keep the Mixtures Orthogonal. 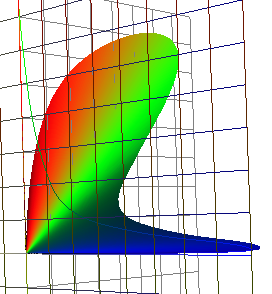 Now Make a Parametric Plot of ω2 vs ω1. Bingo, the Shape is Invariant. 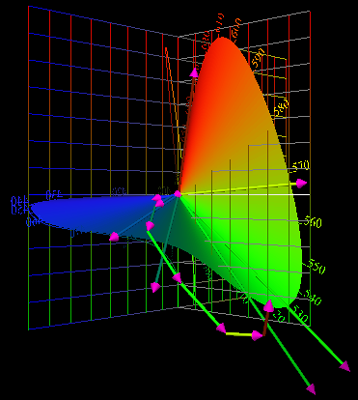 The spectrum locus is the eye's vectorial sensitivity to color. It is not a boundary. The spectrum locus is alternatively the vectorial color of narrow-band lights, at unit power. Prime colors are the wavelengths where radius is a local maximum! 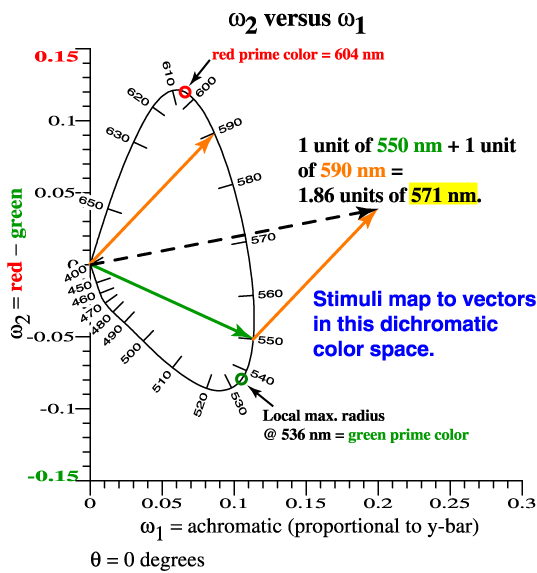 Stalking Prime Colors in the 2 Dimensions of Red and Green. 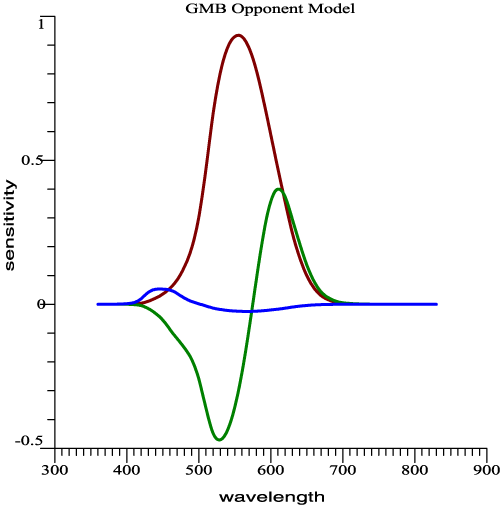 Computing red minus green gives tentative prime colors---the plus and minus peaks of an opponent-color graph. But, the peaks depend on the scaling of red and green, an arbitrary element. 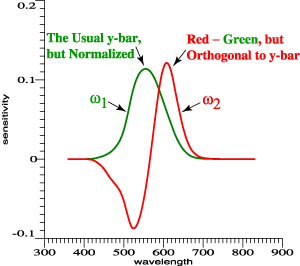 Since achromatic sensitivity (y-bar) is a linear combination of red and green, find an opponent-color function that is orthogonal to y-bar. 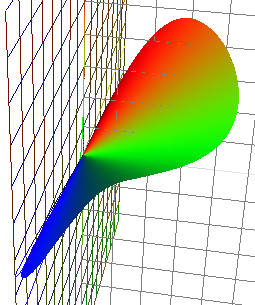 Now we have a rationalized vector space for colors. The prime colors---the wavelengths that act most strongly in mixtures---are the wavelengths that map to the longest vectors, 536 and 604 nm. If we extend this method to include blue cones, then the spectrum locus in 3 dimensions is what Jozef Cohen called The Locus of Unit Monochromats. 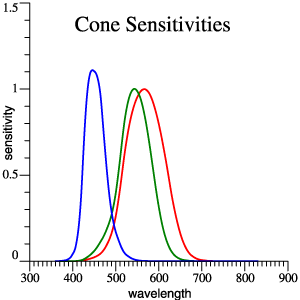 It is the eye's Vectorial Sensitivity to Wavelength. Cohen used different steps to reach this point. 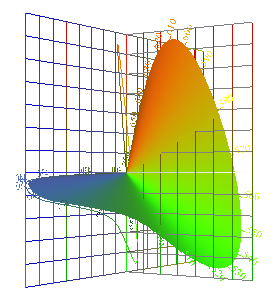 Vectorial Sensitivity to Wavelength, Now in 3 Dimensions. Now include the blue cones to create a set of 3 orthonormal color matching functions. 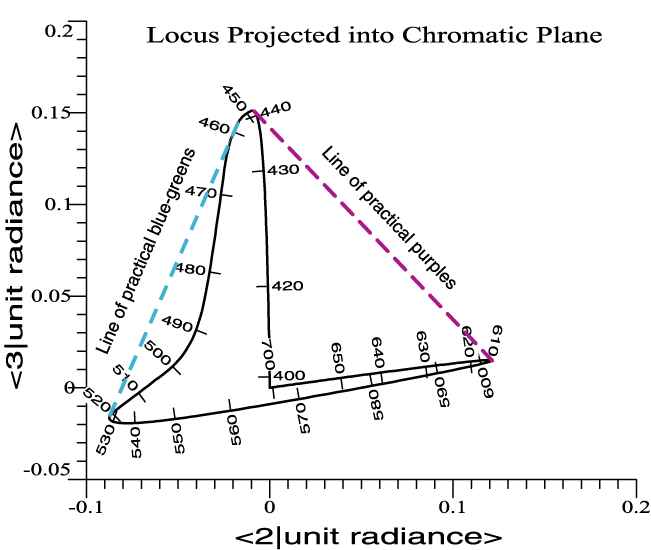 Combining the orthonormal functions into a parametric plot yields Jozef Cohen's "Locus of Unit Monochromats," the eye's Vectorial Sensitivity to Wavelength. Axes have intuitive meanings: Achromatic, Red-Green, and Blue-Yellow. 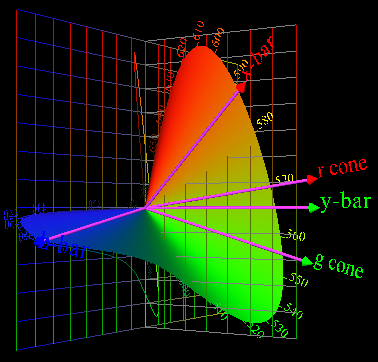 The first two functions, ω1(λ) and ω2(λ), combine red and green cones only. ω1(λ) is a multiple of the familiar y-bar. 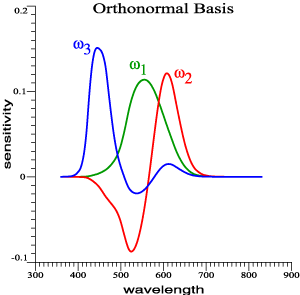 ω1(λ), ω2(λ) and ω3(λ) combine to give the eye's vectorial sensitivity to color. The functions are easily calculated, or get them from this link. A light's tristimulus vector has the same magnitude as the light's "fundamental metamer." The mystery is now gone from Prime Colors. They are the red, green, and blue that map to the longest vectors. They are the wavelengths that act most strongly in mixtures, exactly as Thornton said. 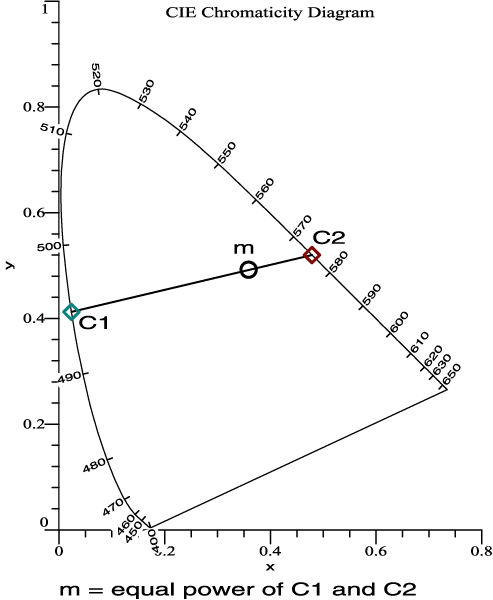 We don't usually learn to graph tristimulus vectors, or compute their magnitudes. Even graphs of the vector (X Y Z) would give some insight, but graphs and magnitudes mean more here. Algebraic benefit: orthonormal functions simplify derivations and formulas. Beginning students can be told flatly "This is the eye's vectorial sensitivity to color." Details can follow as needed. Arrows from the origin show the 8 lines of a laser. They can be projected and modulated. 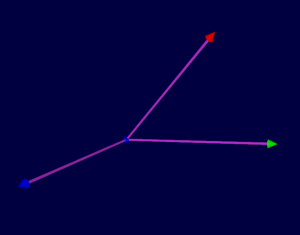 Vectors should be balanced and point in diverse directions. Chained arrows (scaled down) sum to the tristimulus vector of the mixture. 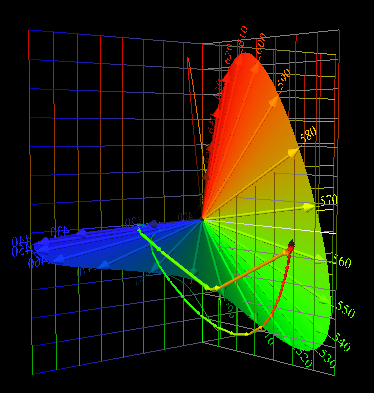 The orthonormal color matching functions map to the axes. 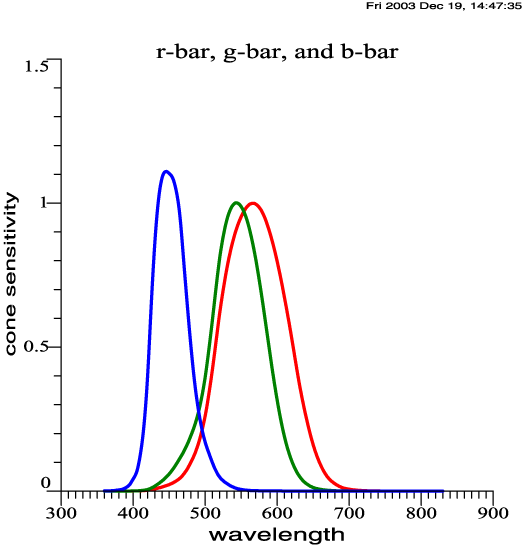 Other color matching functions, such as x-bar, y-bar, z-bar, or cone sensitivities plot as vectors. 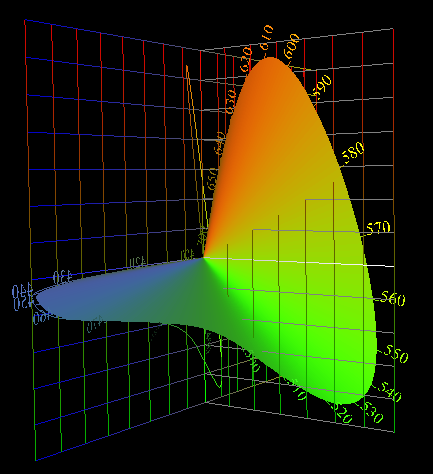 Direction cosines are preserved, from wavelength space to this 3D space. 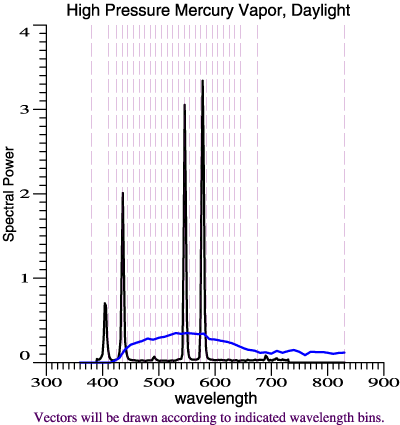 A daylight phase has the same tristimulus vector as a certain high-pressure mercury vapor light. Smooth chain is daylight decomposed into narrow bands. The other chain---a commercial mercury light---takes a shortcut to white, because it is poor in reds and greens. Oh, Yes, Calculating Tristimulus Vectors. Let L be a light, that is a Spectral Power Distribution. Tristimulus vector found the old way. Tristimulus vector found the new way. The calculation is essentially the same, but the benefits of the orthonormal color matching functions are tremendous! What wavelengths make the best primaries in a color mixing experiment? Prime colors---wavelengths that act most strongly in mixtures. Balance of primaries for multi-primary applications. Camera sensitivities, lighting for camera systems, etc. 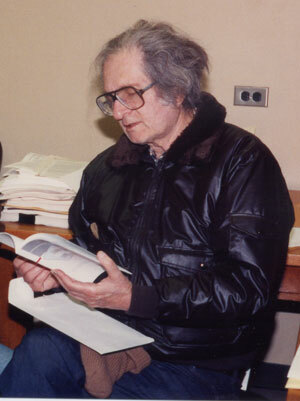 Examples have used the 2° observer, but the methods generalize. David MacAdam and Gershon Buchsbaum who mentioned orthogonal color matching functions. Calculations were done with O-matrix software. Render Asking: James A. Worthey, "Color rendering: asking the question," Color Research and Application 28(6):403-412, December 2003. 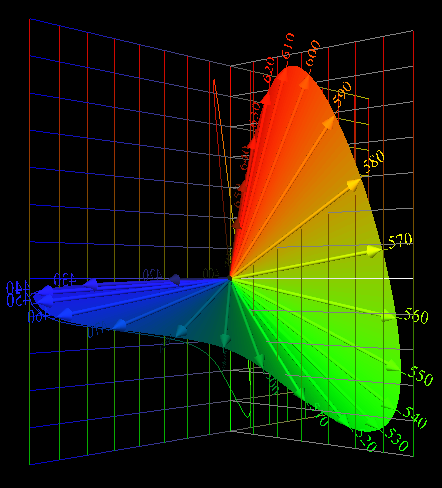 Render Calc: James A. Worthey, "Color rendering: a calculation that estimates colorimetric shifts," Color Research and Application 29(1):43-56, February 2004. 1. What Does "Orthonormal" Mean? 2. Why is the Tristimulus Vector the Best Measure of Stimulus Amplitude? 3. 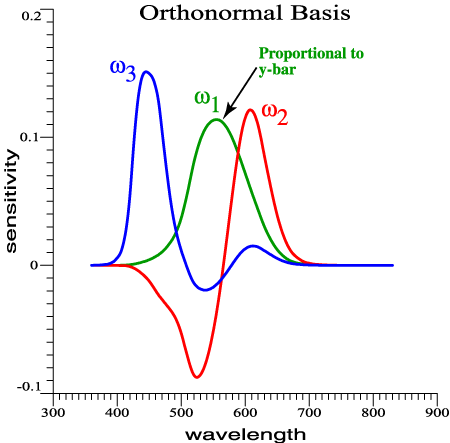 How Does the Orthonormal Basis Relate to Cohen's Matrix R? 2 colors, C1 and C2 are set to equal power. The mixture is m.
1. The initial stage of vision is linear and invariant. 2. TV phosphor and autumn leaf need to act in the independent dimensions of color vision. 3. Orthonormal color matching functions are as indpendent as possible. 4. Most arbitrariness drops out. One axis is whiteness. 5. No dispute with Jozef Cohen or Bill Thornton. 6. Some departure from Cohen's preferred treatment. 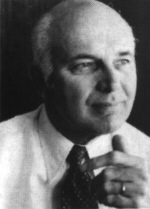 But Cohen preferred the fundamental metamer as an invariant "color vector." With orthonormal basis, we can have it both ways. Tristimulus Vector is a Proxy for the Fundamental Metamer. 7. Color matching functions similar to raw data give an interesting spectrum locus, but X, Y, Z do not. See below.